Wildlife viewers and local farmers can now benefit from a new and innovative partnership that enhances both the ecology of Northwest New Jersey and the economies of our still-rural communities. The New Jersey Audubon Society has teamed-up with the Foodshed Alliance to promote on-farm conservation and to bring visitors to the farm to reap the benefits of the results. "Agritourism and ecotourism provide farmers a chance to diversify their operations, supplement their incomes, improve their communities and care wisely for their environment," NJAS Conservation Planner and Restoration Ecologist John Parke says. "Perhaps the greatest long-term benefit of agritourism and ecotourism is the chance they offer farmers to educate people about the values and benefits of farms. As advocates of rural values, agritourists and nature tourists can become strong allies of family farms, and of the wildlife, habitat and open space they conserve." Through a special NJAS outreach conducted in northwestern New Jersey by Parke, numerous area farms have enrolled in state and federal grant programs promoting on-farm environmental enhancement. Frequently underutilized, these funding programs are not always well promoted by the agencies overseeing them, Parke says. In fact, the government has taken money away from some of these programs because they were not being used. NJAS, recognizing the potential for the conservation grants to impact the last remaining areas suitable for the grassland habitat needed by many bird species to survive, decided to streamline the grant processes. By having outreach workers assist landowners every step of the way, NJAS hoped to encourage enrollment in these environmentally friendly programs. While these conservation programs vary in scope and objective, they all share the same theme: to create environmentally enhanced farms that increase native wildlife habitats while financially assisting the farmer to adopt these beneficial practices. Drainage, water quality, soil improvement, fencing and other improvements can actually increase farm productivity by eliminating topsoil runoff, removing unprofitable marginal lands from production, restoring fallow lands to a grassland (and haying) operation or enhancing pasture nutrients through intensively-managed grazing. NJ Audubon has taken the programs one step further. The idea is to invite visitors to these farmlands that now sprout new grasslands for certain bird species, restored wetlands for the growth of native plant and animal species and buffer zones for wildlife. A new client base would be traveling to the farm, enjoying the positive effects of sound environmental management and purchasing products directly from the farm's fields. both game & non game bird species. Parke initially approached the Foodshed Alliance, a Blairstown-based non-profit supporting local, sustainable farming in northwestern New Jersey, in search of farmers that might like to have a conservation assessment completed for their land. He got more than he bargained for, as he learned of the organization's on-going efforts to promote a growing relationship between consumers and local farmers. Both NJAS and the Foodshed Alliance acknowledge that land used for agricultural production can enhance wildlife diversity by providing the last remaining vestiges of habitat for many species and conserving natural resources. And it can do all this while fulfilling its primary role, which is to feed the local community. "Growing and raising healthy food depends on balanced farm ecosystems with diverse plants and animals, beneficial insects, clean and abundant water, and healthy soil. Farming with nature can enrich the land, respect wildlife habitat, and protect our precious water supply. That's why the Foodshed Alliance-Audubon partnership is a natural partnership," says Tara Bowers, co-coordinator of the Alliance. The fates of family farms and the diversity of our wildlife are inseparable. The same blocks of undeveloped land needed to support family farmers provide the habitat necessary for many species of wildlife. "If both are able to survive here, the farming and conservation community must work together to develop innovative strategies to promote economically viable farm communities and conservation goals," Parke says. 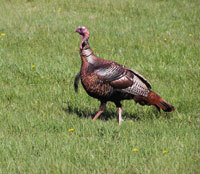 to see native wildlife right on the farm! The partnership has resulted in an organized effort to bring "ecotourists" to selected farms. Field trips ­ organized, advertised, and supervised by NJAS staff ­ will provide the opportunity for birding and other wildlife viewing on these private lands. Visitors will also see firsthand how well-run farms can enhance the environment and be able to purchase products directly from the farmer during the trip, hopefully becoming repeat customers. Hosting farmers exercise control over the field trip's time and duration, group size, and how best to showcase their products. Parke sees it all as a win-win proposition for the land, the farms, the visitors, and the wildlife. 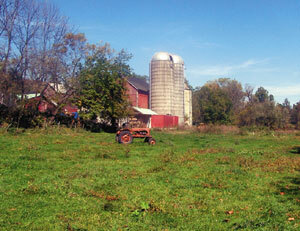 "By having suitable wildlife habitat onsite, it opens up a new clientele to the farmer," Parke adds. "Agritourists and ecotourists are looking for the natural, historical and cultural heart of the place they are visiting, and their defining principle is 'authenticity'. With good interpretation of the natural resources on the farm, including the wildlife that lives there, it adds immensely to the learning experience and overall enjoyment of the farm visit." John Parke, Conservation Planner/Restoration Ecologist NJAS : 908-766-5787 ext. 18 can be contacted for more information regarding enrolling lands in these programs, or for information on field trip participation. Get our newsletter, This Week in the NJ Skylands, with updates, special offers and good ideas! Keep informed about all the great stuff to do in and around Northwest New Jersey by reading our seasonal publication, the Skylands Visitor magazine. You'll find comprehensive portraits more attentive to geographic, cultural, and historical attributes than county and municipal borders. Explore the remarkable personality of this place and get a year-round supply of great things to see and do! !